To familiarize the candidates with Federal Aviation Regulations (FAR) and Joint Aviation Regulation (JAR). To improve safety standards, reduce errors and prevent accidents. Read more about Human Factors For Maintenance Engineers. To familiarize the candidates with Federal Aviation Regulations (FAR), Joint Aviation Regulation (JAR) and the inspection of aircraft structure and systems. 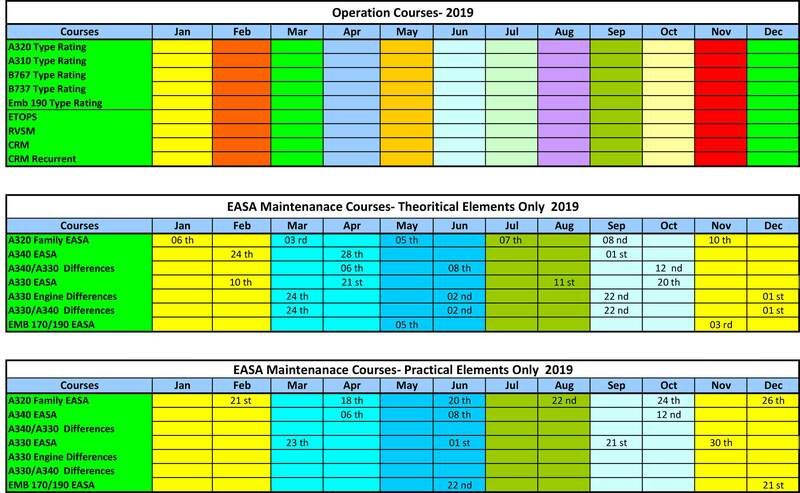 To instruct maintenance engineers on ETOPS basics and technical requirements based on operator ETOPS manual. To instruct maintenance engineers on RVSM basics and technical requirements based on operator maintenance manual. The most important aim of this course is that the trainee must understand the safety management and recognize the four basic elements of the Safety Management System (SMS) and understand the need of quality system and to do his role in which will help achieving a positive safety culture and implanting the quality system,. On successful completion of the course the student will be familiar to the background and history of the theoretical and practical elements of the Fuel Tank Safety (FTS) as required by EASA and FAA, have an overview of Special Federal Aviation Regulations (SFARs) from 14 CFR SFAR 88 of the FAA and of JAA Temporary guidance Leaflet TGL 47, be able to give a detailed description of the concept of ALI, CDCCL and AWL. After completion of the course, the trainee should show competency of demonstrate the safe handling of airplane electrical systems, Line Replaceable Units (LRU), tooling, troubleshooting procedures, electrical measurement, the construction and navigation of the applicable wiring practices manual. • Recall the normal function of these systems as applicable; electrical, fuel, auxiliary power unit, power plant, hydraulic power, landing gear, flight controls, pneumatic power, air conditioning, fire protection, oxygen, water and waste, equipment and furnishings, lights, doors, windows, indicating, recording, communication, navigation and auto flight. • Identify the interfaces between all airframe systems. • Identify and locate components for each engine part. • Describe the function of the subsystems and identify its interface. • Servicing procedures of engine components. • Be able to safely operate the engine after a major repair and/or replacement of engine Components. • Identify normal and abnormal start procedures. To provide the systems differences between the two Engines. Identify and explain controls and indications associated with the engine and its components. Servicing procedures of aircraft engine and its components.